There is nothing new or good about the Great Pacific Garbage Patch (aka the Pacific Trash Vortex), a Texas-sized mass of plastic debris in the North Pacific Gyre. But Project Kaisei and Covanta Energy hope to bring a positive spin to the problem with a partnership that could eventually process nonrecyclable plastic waste from the garbage patch into diesel fuel. The collaboration between Kaisei, an ocean cleanup initiative, and Covanta, a renewable energy company, was brokered by the Clinton Global Initiative. Both organizations are members of CGI's Rethinking Waste subgroup, which works on creative solutions to waste management. The partnership was a natural fit, according to Paul Gilman, Chief Sustainability Officer of Covanta. "We're in the process of piloting technology that converts municipal solid waste, including nonrecyclable plastics, into a diesel substitute. That part of what we do makes a complementary bookend to our focus on plastics in the ocean," he says. "As a company we've done a considerable amount of work on marine debris." Covanta and Kaisei's partnership is in the developing stages, mainly because of technological and financial roadblocks. Kaisei is planning an exploratory mission to the Plastic Vortex for marine debris research, but the organization still needs more funding. And Covanta's plastic-to-diesel technology isn't ready for commercialization quite yet–the company is testing it at a pilot facility in Massachusetts through the end of the year. While a joint Kaisei and Covanta ocean expedition may still be a few years away, Covanta's technology could be used elsewhere in the meantime. "The beauty with this technology is that once it's shown to work, it can be used around the world in any kind of waste management capacity. There are whole coastal communities that are contributing to this [plastic] problem," says Douglas Woodring, Co-Founder of Project Kaisei. Eventually, though, the seemingly endless Plastic Vortex could provide us with fuel for our daily lives. "If things work well, Kaisei will be able to supply us with enough plastic residues to do a demonstration of a conversion to our diesel substitute," Gilman says. 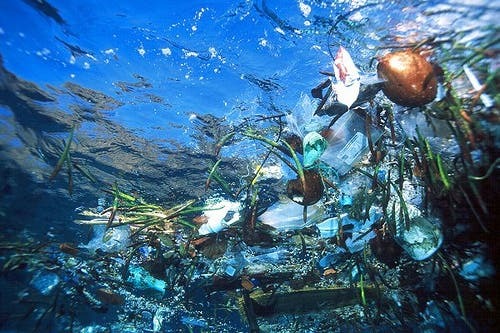 The Great Pacific Garbage Patch has also received a ton of attention since billionaire adventurer and environmentalist David de Rothschild announced his plans to visit the trash mass on the Plastiki, a boat constructed from recycled waste and webs of plastic and a group of architects from Rotterdam have already come up with a plan to covert the gyre into a Hawaii-sized island made entirely out of recycled plastic. The entire project aims to focus global awareness on the thoughtless, unnecessary damage plastic inflicts on the world’s oceans. And potentially guide people towards more constructive ways to re-use plastic. The UN Environment Program estimates that there are 46,000 pieces of plastic litter in every square mile of ocean, and a swirling vortex of trash twice the size of Texas has spawned in the North Pacific. Plastic bags, once icons of customer convenience, cost more than 1.6 billion barrels of oil per year and leave the environment to foot the bill. Each year the world produces 500 billion bags, and they take up to 1,000 years to decompose. They take up space in landfills, litter our streets and parks, pollute the oceans and kill the wildlife that eat them. Sadly, marine researcher Charles Moore at the Algalita Marina Research Foundation in Long Beach says there’s no practical fix for the problem. He has been studying the massive patch for the past 10 years, and said the debris is to the point where it would be nearly impossible to extract. "Any attempt to remove that much plastic from the oceans – it boggles the mind," Moore said from Hawaii, where his crew is docked. "There's just too much, and the ocean is just too big." The trash collects in this remote area, known as the North Pacific Gyre, due to a clockwise trade wind that encircles the Pacific Rim. According to Moore the trash accumulates the same way bubbles clump at the center of hot tub. Ian Kiernan, the Australian founder of Clean Up the World, started his environmental campaign two decades ago after being shocked by the incredible amount of rubbish he saw on an around-the-world solo yacht race. He'll says he’ll never be able the wipe the atrocious site from his memory. "It was just filled with things like furniture, fridges, plastic containers, cigarette lighters, plastic bottles, light globes, televisions and fishing nets," Kiernan says. "It's all so durable it floats. It's just a major problem." It sounds crazy–and maybe it is–but Rothcild's idea makes sense. The biggest concentration of plastic in the ocean has a footprint as large as France and Spain combined. That means there is plenty of plastic already floating around to make an island. And wouldn't it be nice to provide future climate change refugees with a new sustainable home? Not that anyone would necessarily want to live on a hunk of floating plastic, but the idea of taking trash and turning it into something useful is always thought-provoking.